If you've got 15 minutes, then you've got enough time to make our white chocolate-peanut butter crispy treats. 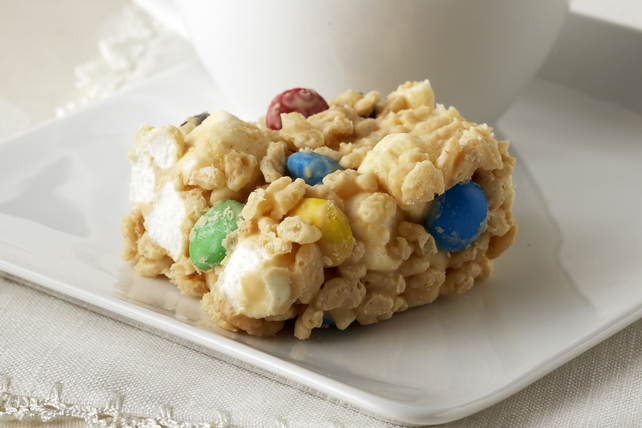 Made with white chocolate, smooth peanut butter, crisp rice cereal, candy-coated chocolate pieces and mini marshmallows, these no-bake Crispy Avalanche Bars are sure to be a hit. Microwave chocolate and peanut butter in large microwaveable bowl on MEDIUM 2 min. or until chocolate is completely melted and mixture is well blended, stirring after each minute. Stir in cereal; cool 5 min. Add remaining ingredients; mix well. Press onto bottom of 13x9-inch pan sprayed with cooking spray. Prepare dessert and cut into bars as directed. Melt 4 squares BAKER'S Semi-Sweet Chocolate as directed on package. Dip corner of each bar in melted chocolate, covering half of the bar. Place on waxed paper-covered baking sheet. Refrigerate until chocolate is firm.